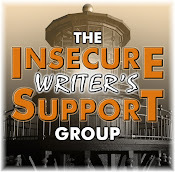 Tuesday is usually my book day, but I'm moving that to Thursday when I discuss influences on my writing. So join me then when I talk about sci-fi author, Timothy Zahn. Today, I gotta take care of two blog awards. Two in one day! Yeah, I can't believe it either. This is a cool award. The rules are that I must mention Cassandra’s name and blog - Cassandra Jade in the Realm. 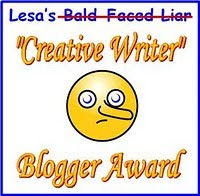 Also I must answer a string of questions with one-word only answers and pass the award to five other bloggers. Short list - it's harder than it sound! 6. Nominate seven "Creative Writers" who might have fun coming up with outrageous lies. 1. I burned down a shed in our back yard when I was ten. 2. I drank three day old Oriental hot sauce when I was three. 3. I played hockey in college. Awww, thanks for thinking I'll be able to lie well, Alex! I'll post it this weekend! That's a fun one and I look forward to it. Alex, you are thoughtful and kind. Thanks for including me in the group of awardees. I'm gonna have to work to live up to this, but nothing wrong with setting the bar high, right? Again, thanks. Ooh, I have no clue. I'm torn between all three, but I'm gonna say you did not burn down the shed. Congratulations on the awards! 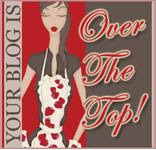 I also gave you the Over the Top on my blog today. I'm the opposite of Helen - i'm going to say that you DID burn down the shed. 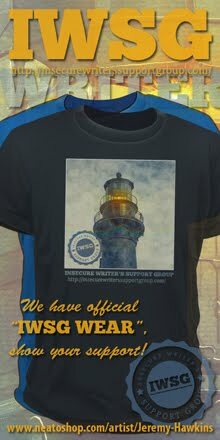 Thanks for the pass it forward, I already got tagged and have my acceptance speech post up on my blog today. Too much fun, hmm Alex? Well, I didn't burn down the shed! But I did drink three day old Oriental hot sauce when I was three - and my mom said I cried for hours! It seems there are a lot of awards floating around at the moment. Congratulations on yours and it was great reading your responses.